One of my main goals is to improve my playing enough to get me back into a band. Using a free metronome for practicing guitar is helping me meet my biggest challenge head on. That challenge is to get my timing back in shape. This means being able to stay with the rhythm of a song and consistently keep the tempo. I'm not the only one that thinks this is important. Check out this interview with John Petrucci, founder of the band Dream Theater. Here are his top 3 practice tips. So I'm going back to the basics. Starting with some basic exercises to improve my timing and rhythm, I use the free metronome to set the beat while I play a scale or chord progression. While these might seem like boring exercises, they'll go a long way in helping me be able to play any style of music. First off, some requirements. You gotta have the basic equipment on hand to fully benefit from these lessons. Obviously, a guitar is the most important (Yeah, that's me, Captain Obvious!). You don't necessarily need to have an amp (even if it's an electric guitar), but it would be nice. Something critical to getting your timing and rhythm in shape is a tool to mark time, or set a beat. As far back as the early 1800s, when musicians learned to play they would use a metronome to mark time. 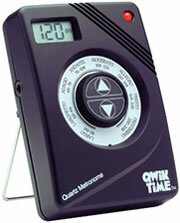 A free metronome is a simple device that keeps a steady tempo (beat), measured in beats-per-minute (BPM). Standard variable tempos can be set from between 40 BPM and 208 BPM. Web Metronome – there's also some other cool tools here. These will work in a pinch, but if you have any speed issues with your internet connection, you may not be able to rely on an online metronome to keep accurate time. Weird Metronome - like a drum machine up to 1000 BPM! For FREE guitar software and lots, lots more visit: TabGuitarLessons to get a free metronome download. However, it's always a good idea to have a physical metronome on hand. That's why I recommend heading over to your favorite local or online music shop and picking up an inexpensive metronome (around $20 US). You can even get combo units that have tuners built in, although this raises the price a bit. Way more than we need to know about sound, but hey, maybe you're the next Tom Scholtz (of the band Boston). He was an MIT trained engineer, and his understanding of electronics and sound waves helped him develop all sorts of cool devices to produce Boston's unique sound. For your entertainment, there's a dude from Brazil that holds the guitar speed record of 320 BPM. His name is Tiago Della Vega. Talk about getting control over your timing! Check out the video of his record-breaking performance. Once you have a free metronome, use it when you practice your scales or chords. Start at 70 to 75 BPM and work through a scale or chord progression. Once you have that down, increase the speed to 80 BPM. Play that perfectly then increase the speed again. Now take a song you'd like to learn. If you read sheet music (and get lucky), there will be a time signature at the beginning of the score, showing what the BPM should be. This gives your goal. Slow it down, set a beat with your free metronome and play the song at a manageable speed like 80 BPM. Play the song perfectly at this speed, then increase to 85 BPM. Repeat until you get to the actual song tempo. The Song Surgeon tool I talked about before is awesome for learning songs and practicing your rhythm. This might seem like a tedious method, but you'll be surprised at how much you improve. You're not just learning one song - you're actually training your ears and fingers to stick with the tempo and rhythm set by the drummer (metronome). As you build up that speed, you'll also be building your confidence. After a short period of time, you'll be able to play many songs at normal speed without any trouble. You'll be jamming along with your favorite artists. Watch out! You'll soon be taking that next step to jamming with real people!